Etsy is an online marketplace where hundreds of thousands of creative people from more than 150 countries sell their handmade crafty goodness. Each week, we’re featuring a handful of our favorite items in our Etsy Roundup. On the menu this week: Cool skins for your iPhone, iPad, MacBook and Kindle. You already know you can turn to Etsy for anything from cute handmade accessories for your dog to cool and unique quilts, but did you realize that Etsy is home to endless accessories for your most prized tech gadgets? Etsy sellers create skins and protective cases for the gadgets you rely on every day: iPhones, iPads, MacBooks, Kindles and more. 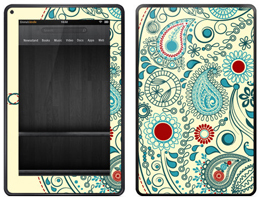 Skins allow you to express your interests while also helping your tech gadgets remain scratch-free. This week, we’re featuring Skunk Wraps, an Etsy seller that helps you turn your favorite tech accessory into a work of art. You can also find Skunk Wraps on their website and on Facebook. Set your Kindle Fire on fire! This vintage paisley skin cover ($15) will give your Amazon Kindle a unique and feminine look. The Kindle skin is available in three finishes: glossy, leather and matte. 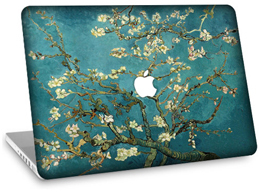 Sure, your silver Apple MacBook is iconic but if you want to make it stand out from the crowd, this Van Gogh blossoming almond tree skin ($25) will do the trick. You can order one for your MacBook Air (11″ or 13″), and rest assured, it will not leave behind a sticky residue on your beloved laptop. Oh, how we love our iPads. But a plain, boring, colorless iPad is no fun, so why not dress it up? 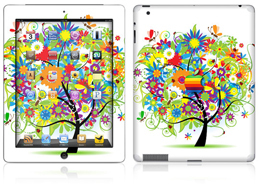 This color blast skin decal for your iPad ($20) will turn your ordinary iPad 2 into a work of art. The skin has an anti-UV coating. Mustaches are all the rage. 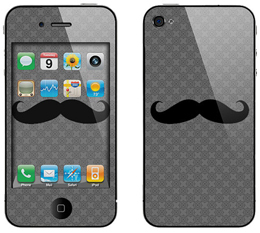 Make your iPhone a mustache-wielding machine with this adorable mustache decal ($10). You receive a download code for a matching digital wallpaper that’s made to line up perfectly with your skin!